Cancerous tissue tends to be stiffer than normal tissue because of changes in the extracellular matrix, the network of secreted molecules that surrounds cells in all tissues. Researchers studying how breast cells respond to this tissue stiffening have identified molecular signals that enable cells to protect themselves from its deleterious effects in ways that may delay the progression of breast cancer. The study, published March 14 in the Journal of Cell Biology, identifies a signaling pathway involving a protein called ROBO1 that, when activated in tumor cells, is associated with increased long-term survival of breast cancer patients. "We identified a circuit that regulates the response of the cell to increasing stiffness in the extracellular matrix and allows cells to push back against external forces," said corresponding author Lindsay Hinck, professor of molecular, cell, and developmental biology at UC Santa Cruz. "In epidemiological studies of women with breast cancer, we found that if this pathway is activated in their tumor cells, it's a protective mechanism and is associated with better prognosis." The ROBO family of signaling proteins--best known for their role in guiding the growth of developing neurons--regulates the cytoskeleton, the internal structures that help cells maintain their shape and carry out essential functions like movement and cell division. The ROBO proteins are receptors in the cell membrane that seem to help cells sense and respond to changes in their environment. 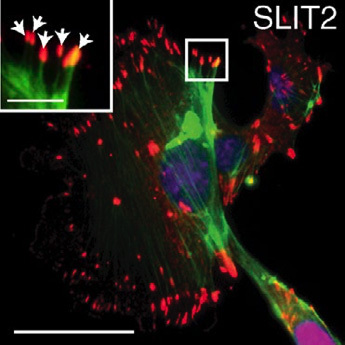 Hinck's team examined the ROBO signaling pathway in breast epithelial cells and found that one family member, ROBO1, enhances cellular contractility and stimulates assembly of cell-matrix adhesions. Stiffer environments caused breast cells to down-regulate a microRNA (miR-203) that normally suppresses the Robo1 gene, thereby elevating ROBO1 protein levels. This, in turn, enhanced cellular contractility and adhesion, allowing cells to retain their shape and position within stiff extracellular matrices. Breast cancer cells lacking ROBO1 were more invasive, suggesting that the up-regulation of ROBO1 in stiff environments may prevent cells from metastasizing to other tissues. Moreover, previous work by Hinck's lab has shown that ROBO1 can suppress cell proliferation, suggesting that this pathway could delay tumor progression. To assess the clinical significance of this pathway, the researchers analyzed breast tumor data from The Cancer Genome Atlas using the UCSC Cancer Genomics Browser. They found that breast cancer patients whose tumors displayed low miR-203/high Robo1 expression had better long-term survival rates. Hinck and her colleagues, including collaborators at UCSF and the University of Wisconsin, now want to confirm that ROBO1 can counteract the pro-tumorigenic effects of tissue stiffening in both mice and humans. UC Santa Cruz graduate student Lily Le is first author of the paper. Other coauthors include Oscar Cazares, Sharmila Chatterjee, Hector Macias, Angel Moran, and Jillian Ramos at UC Santa Cruz; Janna Mouw and Valerie Weaver at UCSF; and Patricia Keeley at the University of Wisconsin, Madison. This research was supported by the California Institute for Regenerative Medicine, National Institutes of Health, National Science Foundation, and the Department of Defense Breast Cancer Research Program.